How to Choose a Coin Folder? Coin folders are certainly one of the most convenient and inexpensive methods around to store and present your coins, along with providing an impressive means to teach and even enlighten anyone you may like to share your coin collection with. Most coin collecting folders are designed in denomination-specific formats and come in eye-catching detail, offering an economical method to store, protect, and display your coinsets of lesser value. Most types and brands of coin folders include the historical information of the coin series, as well as important mintage statistics. No matter which brand you choose, coin folders are an excellent storage device to assist any novice collector, or even anyone who might be unfamiliar with the numismatic hobby, to get a really good start in this fascinating field. For anyone thinking about introducing coin collecting into the home, coin folders are also a great way to introduce youngsters to coin collecting, which will surely become a hobby that will bring them a lifetime of pleasure and satisfaction. Coin folders are designed with individual slots for each coin in a particular series, making it very easy to review which coins are already in the collection, and which ones are still needed to be found to make the set complete. Coin folders are beautifully designed and great to just have nearby to look through, and are also a very inexpensive method to show off your coin collection as it continues to grow. They are ideal not only for your own collection or to give to friends and family members, but as gifts or just for special occasions. Coin folders are handy because they are constructed to open and lay flat to allow an easy view of your entire collection. Each brand or type of coin folder contains a listing of key information to help anyone to learn more about each type of coin the folder contains. Most coin folders have very distinctive, high-quality artwork on their covers, along with actual photos of the coins for each coin series. Whitman Coin Folders are perfect for every coin collector, from beginner on up to the serious numismatist. They have been a brand of choice in coin collecting since the 1930s, and have a great reputation for attention to detail and quality manufacturing since they began in the coin collecting supply industry. The Whitman coin folders open flat for that special all-at-a-glance viewing, yet when closed they reduce to the size of a book for easy and convenient storage. They are available in the most popular coin collection denominations, and come with mintage statistics and many other informative details about the coins they contain and feature stunningly designed outer covers. Whitman also has commemorative coin-boards, like the ones that first brought the hobby of coin collecting into American homes. Whether you would like to start collecting Mercury or Roosevelt Dimes, Indian or Lincoln Cents, Jefferson or BuffaloNickels, Standing Libertyor WashingtonQuarters, State or National Park Quarters, Kennedy or Walking LibertyHalf Dollars, Eisenhower-Anthony, Sacagawea,or Presidential Dollars, Whitman has the coin folder to encompass any coin collecting series.Every Whitman coin folder is manufactured from the safest archival materials on the market. H. E. Harris coin folders make it effortless to study about and absorb the great history of this interesting and worthwhile hobby, while collecting the rich variety of coins that make up the foundation of any serious collection. Each folder comes with priceless historical and educational statistics about the coin’s denomination and mintage statistics, and presents vibrant, full-color photographs of the most classic specimens. Every H. E. Harris coin folder is designed to open flat to effectively illustrate an entire collection at a glance, and re-close to book size for convenient storage and coin protection. These top-quality folders have professionally crafted covers that are made of acid-free materials for the ultimate in safety and long-term protection. The H.E. Harris Company is a trustworthy name in the coin supply business, serving the needs of serious coin collectors with distinction since 1916. 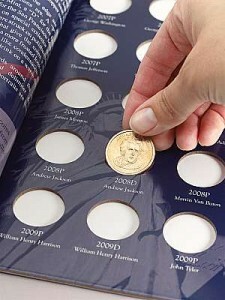 The H. E. Harris coin folders can cleverly and artfully display Indian and Lincoln Cents, Liberty Head, Buffalo and Jefferson Nickels, Mercury and Roosevelt Dimes, Standing Liberty, Washington and 50 States Quarters, Walking Liberty, Franklin and Kennedy Half-Dollars, Eisenhower, Anthony, Sacagawea and Presidential Dollars, and countless others. They are the top-of-the-line component for managing any coin collection. Just like the other top-quality coin folder brands, Littleton coin folders open flat for that all-important at-a-glance viewing of your coin series. Each folder includes all the denomination and mintage data pertaining to each of the coins it holds. They are extremely practical and very durable folders and will perfectly illustrate and preserve an entire collection while opened, yet close to the size of a book to store with ease and convenience. Littleton coin folders are crafted to be not only very attractive, but tough enough for long-term use. They feature that highly recognizable ‘Littleton-look’ with simulated green leather and gold-embossed lettering on the exterior cover. Littleton has one of the nation’s largest coin and currency inventories, consisting of more than 33,000 items, which includes coins from the U.S. and around the world, and everything else you might need for your collection, from supplies to collector guides. Littleton was founded in 1945, and has made collecting fun and easy for thousands of collectors across the globe. Their coin folder selection is outstanding, from Cent, Nickel, Dime, and Quarter Folders, to Statehood and Territories Quarters, Half Dollar, Dollar, 20th Century and National Park Deluxe Folders. Edelman coin folders certainly have one of the most distinctive of all coin folder covers. The high-quality craftsmanship and artwork on every Edelman coin folder makes a very attractive and engaging coin collection display. The Edelman State Quarter and Territories folder cover features an American bald eagle and the Statue of Liberty. The folders provide an abundance of exceptional highlights every coin collector willvalue, including an extensive array of background information pertaining to the coin series, and a creatively designed back flap that offers superior coin protection. Edelman coin folders are truly a work of art and an outstanding addition for any beginner’s collecting requirements, or an extremely attractive showcase for an experienced collector’s prized specimens. Edelman’s Presidential Dollar P & D folder is available in two volumes. Volume I presents the years 2007 through 2011, and Volume II continues the series with the years 2011 through 2015. Each tri-panel Presidential folder will hold 36 coins, with slots for both Philadelphia and Denver mints, and includes referencing flaps that fit between each panel for added coin protection, along with interesting facts about each President. Edelman also has a stunning Presidential Date Set Dollar folder, as well as a United States Lincoln Cents 1909-2009 date set coin folder that will hold one penny for each year from 1909 – 2009, with four slots for 2009. Whatever your coin storage needs, these coin folders can be an integral part of your coin collection strategy. They are great to look at, are both durable and affordable, make perfect presentation or showcase possibilities, and are produced by solid and respectable names in the coin collecting industry. They offer a well-crafted, attractive, and secure storage method for anyone’s coin collection, and will provide many years of efficient, educational, and organized coin collecting enjoyment.